Where is the market/what is the postcode? Smithfield is located within the Square Mile of the City of London bordered on one side by Charterhouse Street and on another by Farringdon Road. For online maps and satellite navigations systems use the postcode EC1A 9PS. It is very easy to reach by tube with both Farringdon and the Barbican stations being just a short walk away. The Smithfield underground car park is open 24 hours a day, has 581 parking spaces including six designated electric vehicle vehicle charging bays and costs £3 per hour. Market customers get a special rate of £1.50 between 9pm – 10am for up to 3 hours Sunday to Friday, if it is over 3 hours it is £3. The entrance is from West Smithfield. There are parking meters in the streets around the markets. 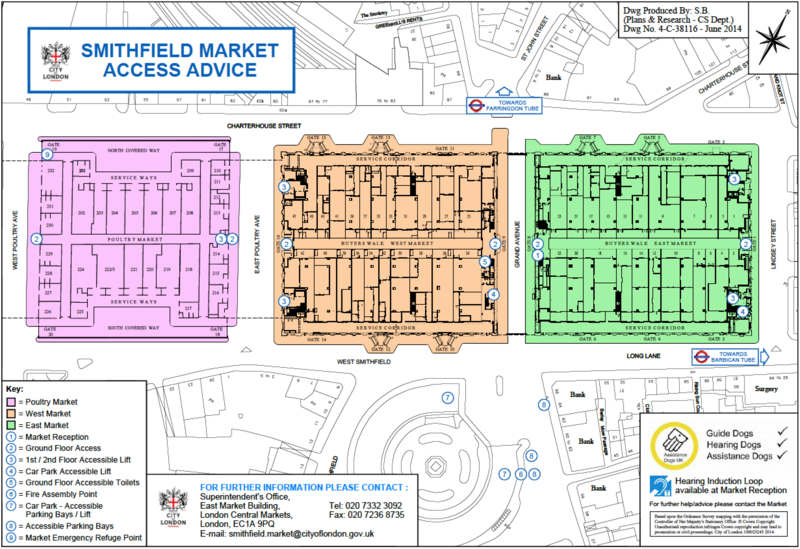 However, Smithfield is within the Congestion Charge Zone, so a fee is charged after 7am. Are there any parking restrictions in the car park? There is a two metre height restriction in the car park. There are loading bays around the Market for large vans and lorries. There is also a goods lift to carry stock into the car park if required. Is there access for the disabled to the markets? The market is all on one level and the central Buyers’ Walk is wide and spacious. However, this is a working market and you will encounter people moving cases of meat around. You may find it easier if you have a companion with you. There are disabled parking bays on both floors of the car park. Is anyone allowed into the market? The market and its Buyers Walk are open to all from 2am Monday to Friday, except Bank Holidays. To see it at its best and with its full range of services and products you should arrive before 7am. The Market is not open on Saturday and Sunday mornings. Anyone can buy meat, poultry and provisions at Smithfield. It is open to the public by Charter: walk through the Market, look around, talk to the salesmen on the front of the stalls. You will find a wide choice and high quality produce at excellent prices. When does the market open? The market opens for business from 2am. Arrive before 7am to find the whole range of stalls open. Individuals, companies and restaurateurs can buy from any of the Market Traders, and from any of their stalls. Some specialise in certain types of meat or poultry, others sell all types, while more sell pre-packed or meat- based products such as hams and sausages. Will the stallholders cut meat for me? Some businesses specialise in cutting to order. If you are buying for a restaurant or a business then talk to the supplier about ordering in advance. Otherwise, talk to the salesmen and see what is available. Like any commodity, prices fluctuate with supply and demand. Talk to the salesmen and compare the best prices of the day! Do you sell Halal or Organic meats or poultry? Both are available in the market. Use the search function to find the traders who stock these. That is up to individual traders, or you can organise your own collection and delivery. Can I buy non-meat items in the market? Smithfield is primarily a market dealing with cut and boxed meats and poultry – however some traders deal in provisions such as olive oils and cheeses (see pages on individual Traders or the site search). Are stalls still available for rent within the market? Currently no stalls are available for rent. All rental enquiries should be addressed to the City of London Corporation which owns and runs the market. smithfield.market@cityoflondon.gov.uk. Is it possible to photograph or film in the market? The Superintendent’s office will consider the request and liaise with the Smithfield Market Tenants’ Association where appropriate before issuing a permit. Are there any rules I need to adhere to when on the market? There is no smoking, eating or drinking anywhere in the market. If you are collecting orders from the service corridors at the back of the shops remember that a hard hat and a white coat must be worn (hard hats are available to buy from the City of London Corporation) – protective clothing is not required in the central Buyers Walk. Are there any vacancies for market workers? Vacancies are advertised on the notice board in Grand Avenue in the centre of the market, or you could look at individual businesses’ own websites (see the Traders section for addresses).